Nokia, once the leader of mobile market, is working hard for a successful comeback. Previously, we reported that two Nokia smartphones with Android v7.0 Nougat and Snapdragon 820 chipset have been spotted online. Now, a new Nokia device with Snapdragon 430, 3 GB RAM and Android 7.0 Nougat have been spotted on Geekbench. Unlike the previous flagship devices, this phone is expected to be a budget segment phone priced under the 10k mark. Nokia previously launched Nokia N1 tab with 7.9-inch IPS display, 5300mAh battery and Android 5.0 Lollipop in 2014. The company granted HMD Global the exclusive license to create Nokia-branded Android mobile phones and tablets in May. Since then the comeback of this highly popular brand is much awaited. The rumors about these new phones shows that Nokia will soon be back in business. 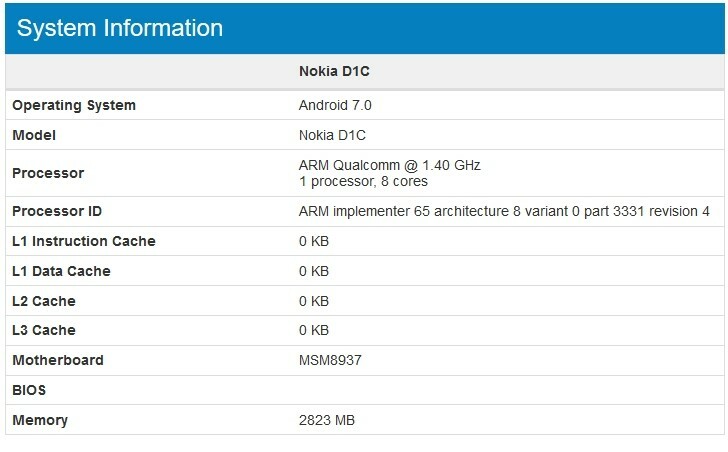 Let us take a look at the expected specifications of this new device, Nokia D1C. Nokia D1C is expected to be powered by a 1.4 Ghz octa-core processor with Qualcomm’s MSM8937 Snapdragon 430 chipset and Adreno 505 GPU, coupled with 3 GB RAM. Whereas, the other two flagship phones are expected to come with a premium Snapdragon 820 chipset. Nokia D1C will run on the latest Android 7.0 Nougat. The phone scored 656 in single-core performance and 3120 in multi-score performance on Geekbench. Nokia D1C could be named as Nokia 5320 and it is expected to be priced around 9,000 INR. The phone is expected to come out after the launch of the other two flagship devices that were spotted on Geekbench earlier. They would be, most probably, unveiled before the year ends, i.e in 2016 itself.